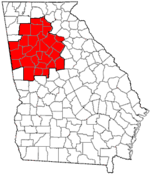 Originally the third stop from Atlanta on the Macon and Western Railroad, the city was incorporated in 1908. The community was named for the parklike setting of the original town site. The 1,465-acre (5.93 km2) Fort Gillem was founded nearby in 1941 and was annexed into the city in 1973. Forest Park is located at 33°37′11″N 84°21′57″W﻿ / ﻿33.619659°N 84.365782°W﻿ / 33.619659; -84.365782. According to the United States Census Bureau, the city has a total area of 9.4 square miles (24 km2), of which 9.4 square miles (24 km2) is land and 0.04 square miles (0.10 km2) (0.43%) is water. There were 6,845 households out of which 37.0% had children under the age of 18 living with them, 40.0% were married couples living together, 22.5% had a female householder with no husband present, and 29.3% were non-families. 22.5% of all households were made up of individuals and 7.3% had someone living alone who was 65 years of age or older. The average household size was 2.98 and the average family size was 3.42. In the city, the population was spread out with 28.1% under the age of 18, 13.9% from 18 to 24, 33.6% from 25 to 44, 16.0% from 45 to 64, and 8.7% who were 65 years of age or older. The median age was 29 years. For every 100 females, there were 105.9 males. For every 100 females age 18 and over, there were 105.9 males. The median income for a household in the city was $33,556, and the median income for a family was $36,029. Males had a median income of $27,381 versus $23,104 for females. The per capita income for the city was $13,778. About 12.0% of families and 30.5% of the population were below the poverty line, including 20.6% of those under age 18 and 9.3% of those age 65 or over. 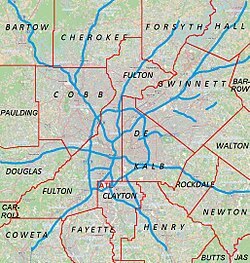 Public education in the city of Forest Park is provided by Clayton County Public Schools. Schools in the Forest Park area include four elementary schools, two middles schools and one high school. There is commuter rail service in the planning stages along the Norfolk Southern line, with proposed stations in Forest Park, Morrow, Jonesboro, and initially ending at Lovejoy. ^ “Location”. City of Forest Park, Georgia. 2009-07-01. Archived from the original on 2010-03-04. Retrieved 2010-03-05. City of Forest Park, Georgia – Official site.